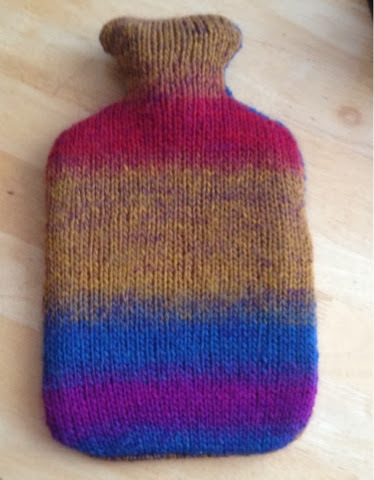 I was over the moon to receive a fabulous knitted covered hot water bottle. As we are now in the winter months this is the perfect accessory for me to try as i suffer from cold hands and feet. So over the course of the week i stuck to my usual bed time routine to unwind, which consists of some TV and hot chocolate before bed..but now incorporating the hot water bottle..each night I placed the hot water bottle in the bed a few minutes before i climbed in..it really helped to warm the bed making me feel very warm and cosy and relaxed..i actually fell asleep much quicker than before and found i woke up less in the night, as i used to wake up a few times feeling cold..i feel that this has been a very positive experience as i am waking up feeling alot more refreshed in the mornings..so i will continue using the hot water bottle.